Lydia Gibala learns the detailed process of recreating Tony Tripp’s elegant costumes. 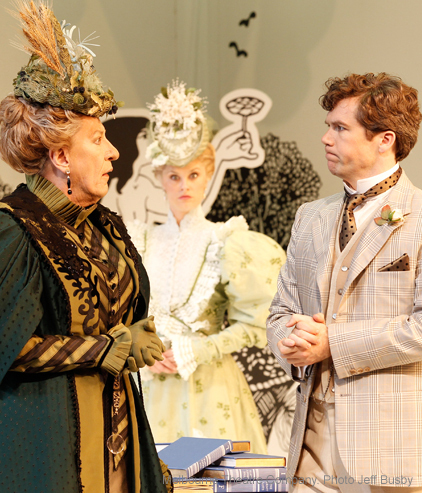 The Importance of Being Earnest officially opens tonight, but those of you who’ve attended our preview performances will already have seen Tony Tripp’s beautifully-designed pop-up book set, and the exquisite 1890’s style dresses and suits worn by the cast. 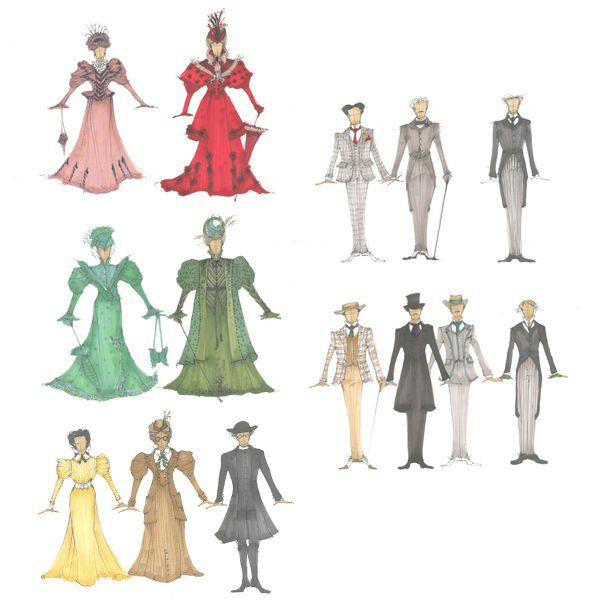 As with the set, none of the fourteen costumes that appear in the play are the original pieces from the 1988 production – all are brand new recreations which have been lovingly realised by talented designer Tracy Grant Lord, from Tony’s original designs. Creating Tony’s work from scratch was no mean feat, Tracy says. “From commencement to opening night I will have been working on Earnest for approximately four months, with the work intensifying over the last 6 weeks”. Tony Tripp’s original costume designs, as realised by designer Tracy Grant Lord. However, she admits the most challenging part of the process was ensuring her designs lived up to what Tony would have wanted if he had been able to revisit the production himself. As a designer with her own creative style it is a delicate operation to recreate the work of another artist without having the luxury to consult with them. Although familiar with Tripp’s style through admiration for his work, Tracy also relied upon an archival film recording of the 1988 production, as well as some original costume components for reference. “It is an unusual and quite difficult brief, but I approached it with the thought that if Tony were doing it again, how would he like to have seen it evolve as it naturally would after 23 years, and for a completely new company of actors,” Tracy says. The broader range of fabrics and finishing trims available now, over two decades later, has also allowed her to include more depth of colour and texture into the finished costumes – all as suggested in Tony’s original designs. 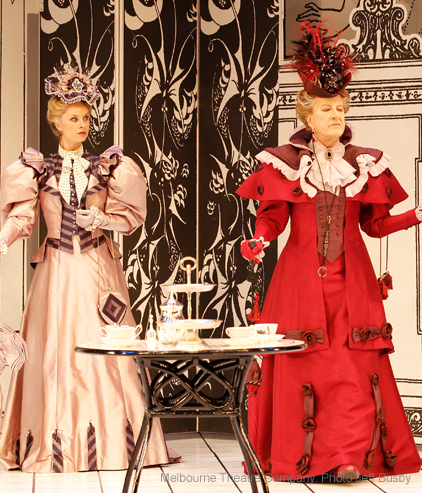 And as immediately stunning as the female costumes are with their pouffs, frills and embellishments, the eight three-piece suits worn by the male cast are equally refined in their detail. 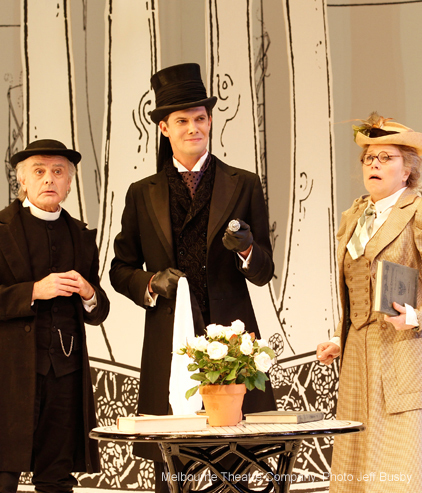 Each takes three fittings and over 40 hours to complete, as John Molloy, our wardrobe supervisor and resident tailor, could well tell you – he made all the suits for the original production too! But as you can see on the stage and in the images below, our talented team have put their skills to excellent use – Tony’s stunning designs are now living pieces of art in their own right.